The scattered village lies near the point where Sussex, Hampshire and Surrey meet. 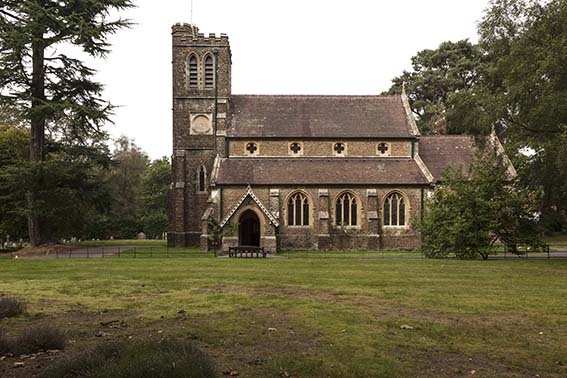 In the earliest records it was ecclesiastically already a chapelry of Trotton with the alternative name of Tuxlith and remained so until it became a parish in 1863. However, the old chapel is distinctly older than any part of Trotton church and it is conceivable that the the first parish church was here. 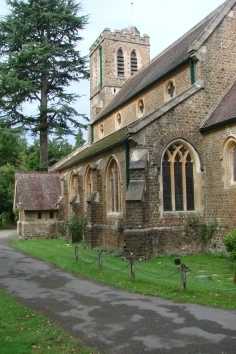 The old chapel stands in the same wooded churchyard, close to the old A3, as the new church which was built in 1878-80 after the parish had been established. 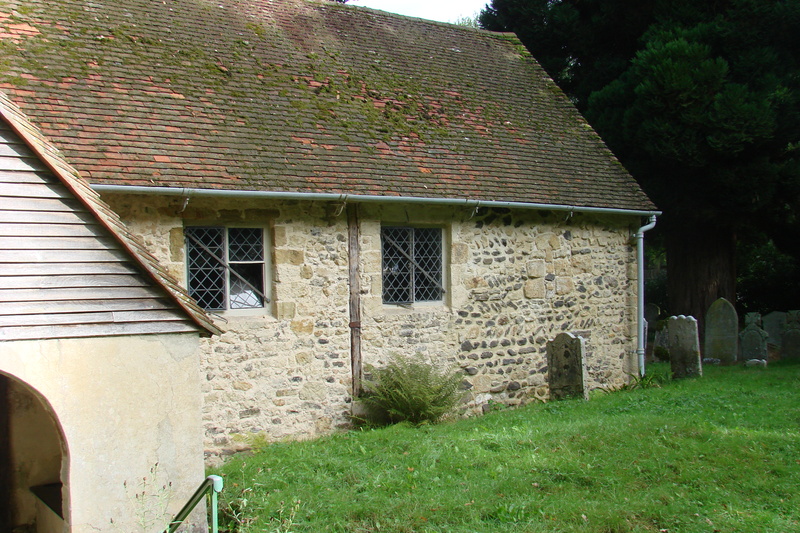 The old chapel was retained and after long neglect passed to the Friends of Friendless Churches in 1974 (2 p120). Since then, it has been repaired and properly investigated. Both old and new churches are dedicated to St Luke. 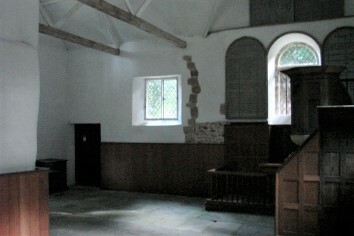 A late C11 chapel, probably a single cell, was altered later in the Middle Ages and more substantially in 1835, when a north transept was added. 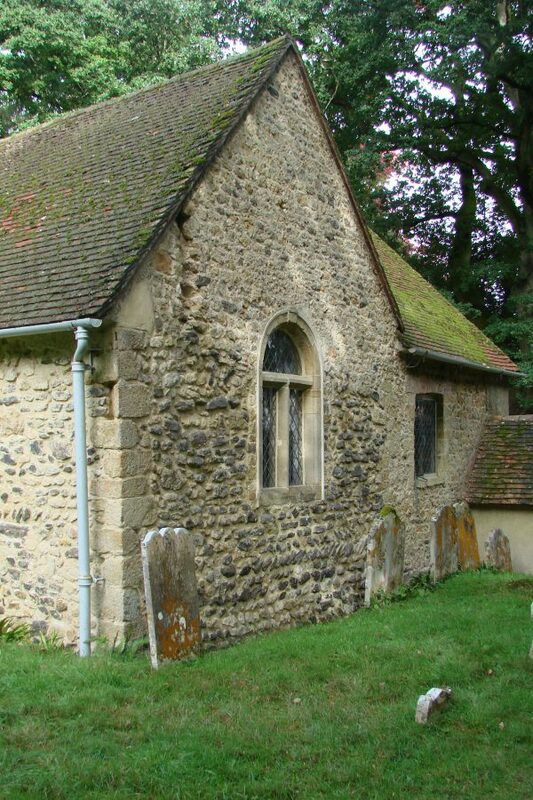 Until recently it was assumed the chapel was little older than the first documentary reference in 1532 (SRS 45 p260), but when cement render that was probably early C19 was stripped, the walls proved to be of stone rubble with large west quoins, the north ones obscured by a C19 vestry. There are more massive stones in the jambs of the south doorway, some herringbone masonry at the south east corner and a blocked single-splayed, round-headed window with a head formed from a single stone and a rebate for a shutter. All this is late C11, including the lower east wall, showing the chapel was never lengthened. The thinner centre part of the south wall has been rebuilt, though also in stone, with some timbering. 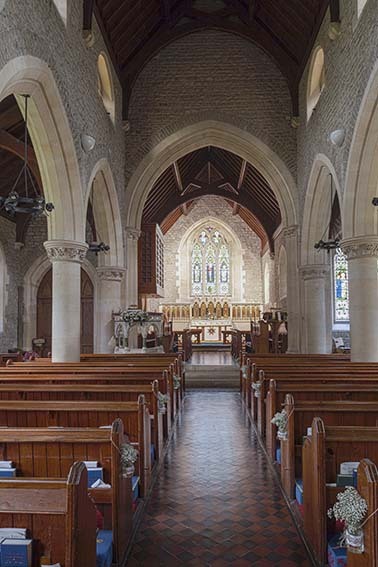 Lloyd suggests (3 pp2-4) there were originally a nave and chancel, separated by an arch, and that the eastern part was rebuilt 3ft wider in the later C12. 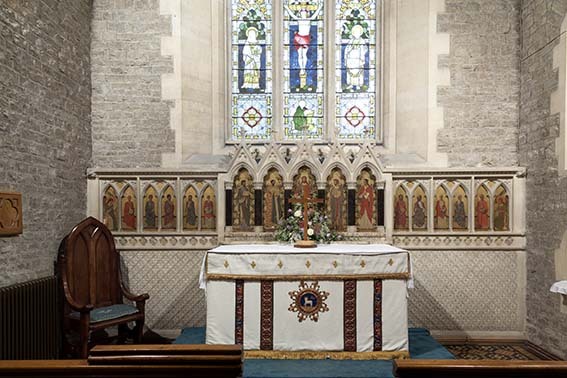 Without archaeological examination certainty is impossible, but it is unlikely that so much work would have been done for so little gain; modest churches of this date without chancel arches are frequent. Expansion would more probably have entailed an aisle or a lengthened chancel, of which there are no signs. A C13 piscina (see below) remains and around 1500 some windows may have been altered – the jambs of a large west one are visible. Later history is poorly documented before a large north east transept, with its own entrance and gallery (2 p124) like those formerly found at Northchapel and Fishbourne, was added in 1835. 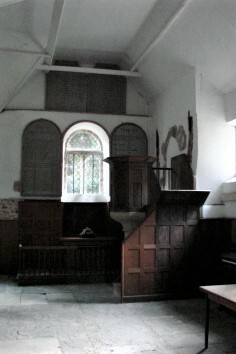 The position was intended to allow as many people as possible to see the pulpit at the south east angle. Only here has this arrangement survived unaltered. The south wall was probably rebuilt at this time, with timber-framed windows and so were the south porch and a round-headed, transomed east window. The west end was remodelled with a stone belfry on two heavy buttresses, in place of the boarded one on the Sharpe Collection drawing (1805), and a plain stone mullioned window in the gable. There was probably already a west gallery, but an external stair was built at the south west corner. There may also have been work to the roof, but this is plastered. After 1880, the chapel was used as a Sunday School until it fell into disrepair in the 1930s. Presumably it was during the ensuing period that the box pews seen by Arthur Mee (p262), probably around 1930, were lost. At all events, it was in a sorry state when taken over by the Friends, for whom D Nye in 1969 prepared a scheme of repair and restoration (2 p120). For lack of funds, little was done beyond making it weatherproof, until in 1993 Sir H Bennett (2 p125) refitted the interior, re-using old fittings where possible, and exposed the exterior stonework. Altar rails: Plain and probably of 1835. Brass: One, dated 1662 (Harrison p92), has vanished. Commandment etc tables: (East wall) Probably 1835. Glass: (Head of east window – missing, probably since the 1950s) Royal Arms, as prescribed between 1802 and 1837, but perhaps dating from the 1835 alterations. 1. (Behind the pulpit) Small and square-headed, probably C13. 2. (Adjacent) Larger with a plain pointed head and probably also C13, though there is no reason to have two so close together. 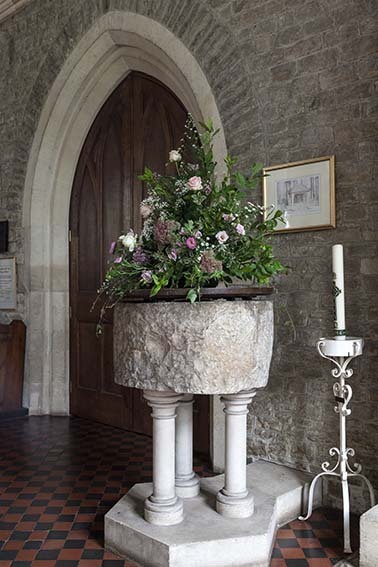 Pulpit: Probably cut down from a three-decker pulpit of about 1800 and standing on a delicately shaped stone stem. 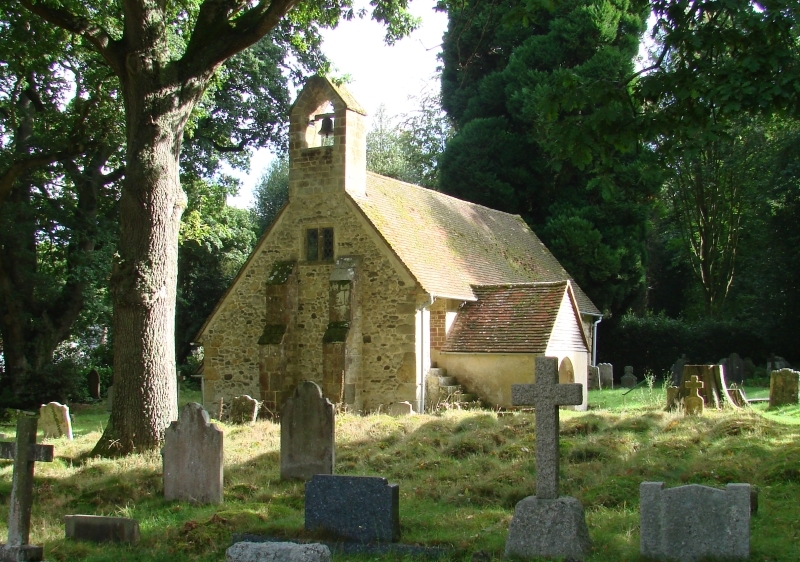 After the establishment of the parish, the old church was described as ‘one of the worst and most inefficient in England’ (BN 35 p408). Early efforts were made to replace it and the dated foundation stone in the south aisle records that this was finally achieved in 1878, largely at the instigation of George Street, a churchwarden (2 p119). He employed his brother W C Street, not noted for his churches, as architect (WSRO Par 139/4/2), though the more eminent G E Street, who was no relation, has also erroneously, though seemingly on good authority, been credited (see 1 for details). The style is early C14 and it is faced inside and out in a rough finished dark coloured stone with lighter dressings. Though not large, it is assertive and more in keeping with a suburb than the Sussex countryside. There is no tower arch, though the high arcades and moulded chancel arch emphasise the tall internal proportions. The tall but thin tower that was completed in 1880 also involved W C Street’s then partner, H G English (WSRO ibid). Font: Rough circular bowl from the old church, of uncertain date, though included in www.crsbi.ac.uk (retrieved on 8/4/2013) which implies a dating of before c1200. It stands on three C19 shafts. 1. (Chancel east and two south windows) According to CDK both the east and south windows are by Clayton and Bell, 1880-82 (CDK 1882 pt 2 p162). 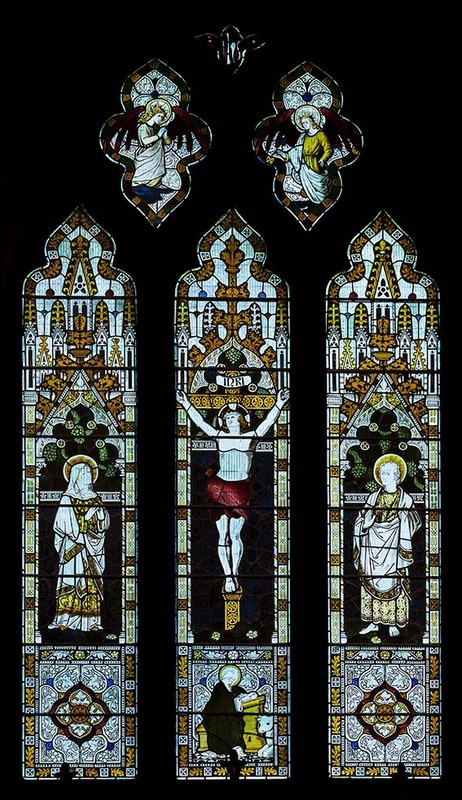 However, although this does appear to be the case with the south windows, Robert Eberhard has found another contemporary source which gives the east one to G Bell (www.stainedglassrecords.org retrieved on 7/10/2014) and names the designer as ‘Streat’. The latter is most probably a garbled version of the architect’s name, as he designed others of the original fittings. This attribution is all the more likely in view of the high level of inaccuracy over names in CDK. 2. 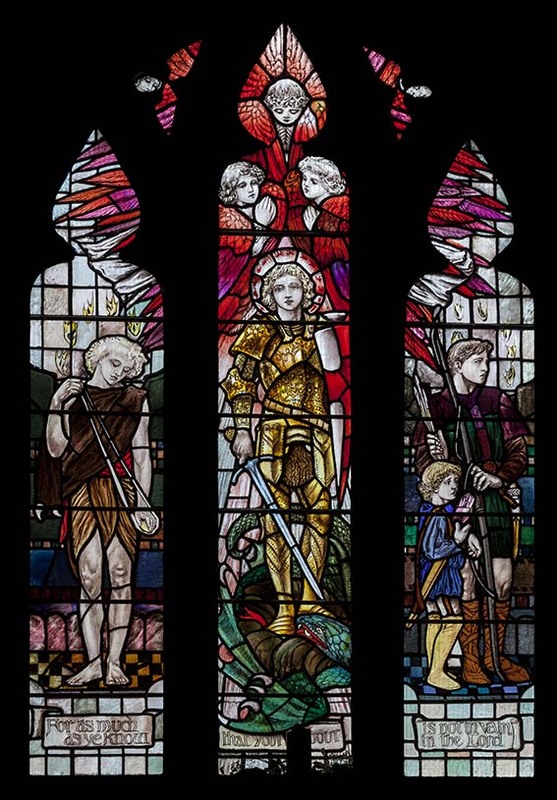 (South aisle, west window) P Bacon and Brothers, 1894, in memory of George Street (CDG 6 p99). 3. 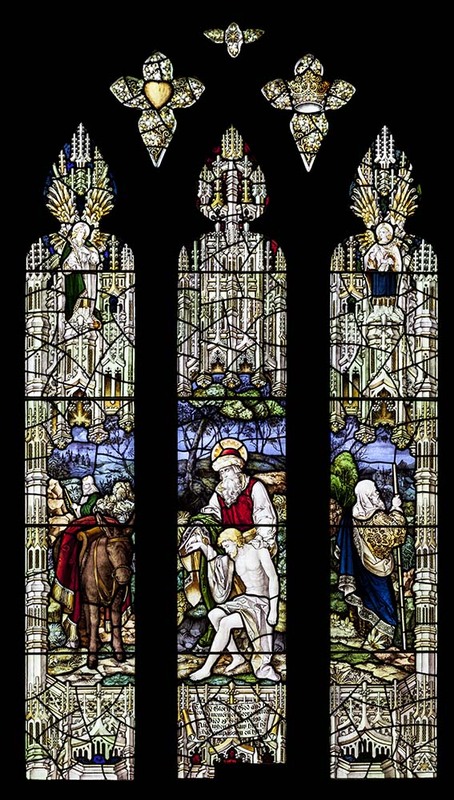 (South aisle, first window) C Whall, 1899 (CDG 71 p133). 4. 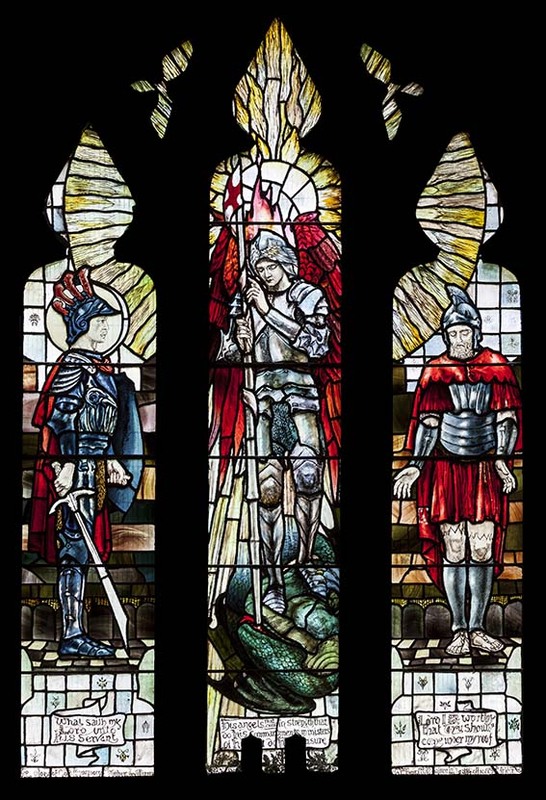 (North aisle, first window) C Whall,1904 (WSRO Fac 4404). The designs are closely related, consisting of large single figures in each light, the central one winged and predominantly coloured red. 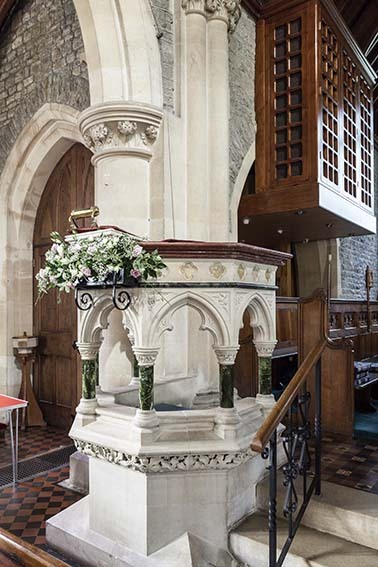 Pulpit: W C Street, 1884 (CDK 1884 pt 2 p156) with open stone arcading. Reredos: Arcaded of stone, marble and mosaic. W C Street, 1882 (CDK 1882 pt 2 ibid). Wooden panel: (West end) Carved and dated 1658. 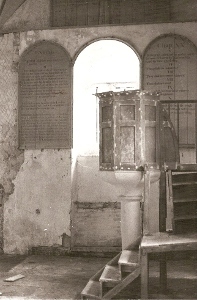 Thought to be from a gallery in the old church (3 p14). My thanks to Nick Wiseman for the photographs of the new church except for one of the exterior shots.